I remember running down a road on my way to a nursery of flowers. I remember her smile and her laugh when I was my best self and she looked at me like I could do no wrong and was whole. I remember how she looked at me the same way even when I wasn’t. I remember her hand in mine and how that felt, as if something and someone belonged to me. I don’t know any other way to describe this book except that it broke my heart in a million little pieces and left me crying for hours. You may read this and think, “Well, I won’t be reading THAT book.” But if you’re like me, and sometimes you seek out certain songs, books, movies, etc., so that you can feel something more deeply than you’ve ever felt before, then maybe you’ll consider this beautifully-written book that gives the best depiction of bipolar disorder that I’ve ever seen. All the Bright Places is told from two viewpoints—Violet and Theodore Finch (a.k.a. “Finch). When the book opens they have both snuck up to the bell tower on their school’s campus—Violet, because she is still reeling from the death of her older sister in a car accident, and Finch, because as he so bluntly puts it, is wondering if “Today is a good day to die.” Finch is surprised to find himself talking Violet into climbing back off the ledge, as he knows the crowd she hangs out with is pretty popular and she doesn’t strike him as the depressed type. After their encounter, he becomes curious to learn more about her and pursues her until they are paired together on a class project where they are challenged to learn more about their home state of Indiana. He even pens a set of “Rules for Wandering” for them both. Chapter by chapter, the layers of Violet and Finch are revealed. Their home lives couldn’t be more different, and Violet watches as her ex-boyfriend and his teammates relentlessly bully Finch for reasons she can’t understand. Listening to Finch describe the way he feels when he is “awake” versus when he is “asleep” gives the reader an enlightening picture of the highs and lows of someone with bipolar disorder (Finch never says he has it but it becomes more and more clear throughout the book that he is undiagnosed and should probably be medicated). Violet and Finch work together on their class project where they wander all over the state (this takes some doing at first, as Violet hasn’t ridden in a car since she and her sister’s accident) visiting unusual places like Hoosier Hill (with its elevation of 1,257 feet) to a farm where a man has built one-person amusement parks ride out of scrap metal. Finch’s hard work pays off—he slowly starts to pull Violet out of her shell and against her wishes, she finds herself drawn to him. She also learns a few of the family secrets he’s been hiding all his life, and begins to realize the highs and lows of his personality may be doing him more harm than good. This book is a difficult read for anyone who has ever watched a loved one go through a mental illness. Violet is a normal teenage girl who truly believes love can help them both overcome their obstacles. Unfortunately, the novel does not have a happy ending. Author Jennifer Niven shared her own personal story at the end of the book which sheds lot of light on the trajectory of the story. In that moment, I’m thankful I’m not a parent and I wonder if I ever will be. What a terrible feeling to love someone and not be able to help them. Actually, I know exactly how that feels. If you look at this book in my Kindle, you’ll see pages upon pages of highlighted material that made me pause. It’s one of those books that you wish you had the courage and talent to write yourself. 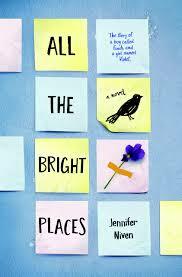 Bravo, Jennifer Niven, and I’m sorry for what you had to go through to get to this place.